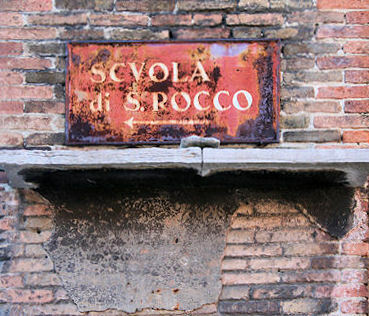 In 1467, the scuole in Venice were officially organised by merging the artisan and common scuole into the Scuole Piccole (Small Schools) and the Scuole Grandi (Great Schools). The latter were created from the previously-named Scuole dei Battuti (of the Beaten) who saw ritual self-flagellation as an act of penitence for the redemption of the individual and the community. This tendency in northern Italy had sprung from the late-13th century mood of doom and repentance, following years of famine, plague and civil strife. As the desire for expiation waned this flaying became more ritual in nature, but poorer scuola members could be paid to undertake the punishment, or forced with the threat of withdrawal of charitable payouts. There were also schools for Venice's citizens from elsewhere, like Greece, Germany, Dalmatia (the Schiavoni), Florence and Bergamo. At the funeral of Cardinal Zen in 1501, Marin Sanudo counted 210 confraternity banners. The Scuole Grande all had their own buildings, built in the 15th and 16th Centuries, the Scuole Piccolo tended not to. 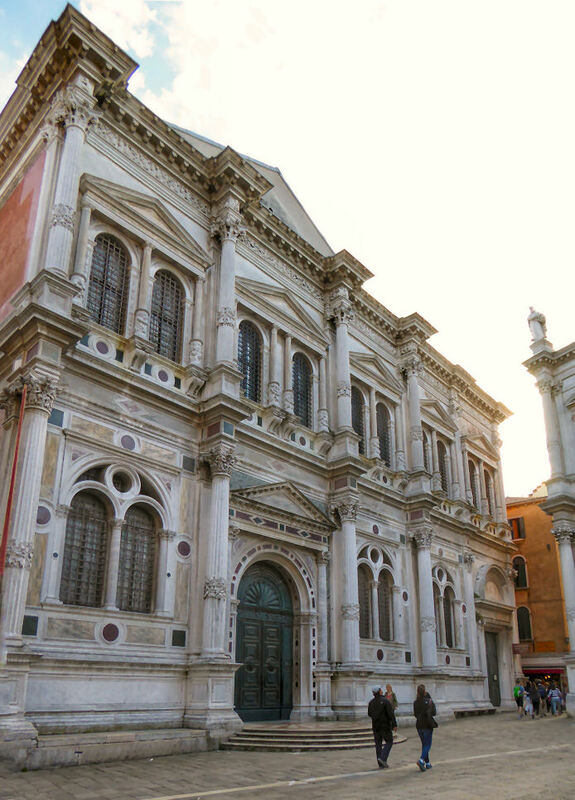 The earliest-founded scuola grande were Santa Maria dell Carita and San Marco in 1260, then San Giovanni Evangelista in 1261 and Santa Maria della Misericordia in 1308. These were the original four, to which were added the Scuola di San Rocco in 1478 and in 1552 the Scuola di San Teodoro. Then in 1767, only thirty years before the fall of the Republic of Venice, the Scuola dei Carmini, which had been founded in 1593, was added to the list. There were, briefly, nine and 925 scuole piccole. 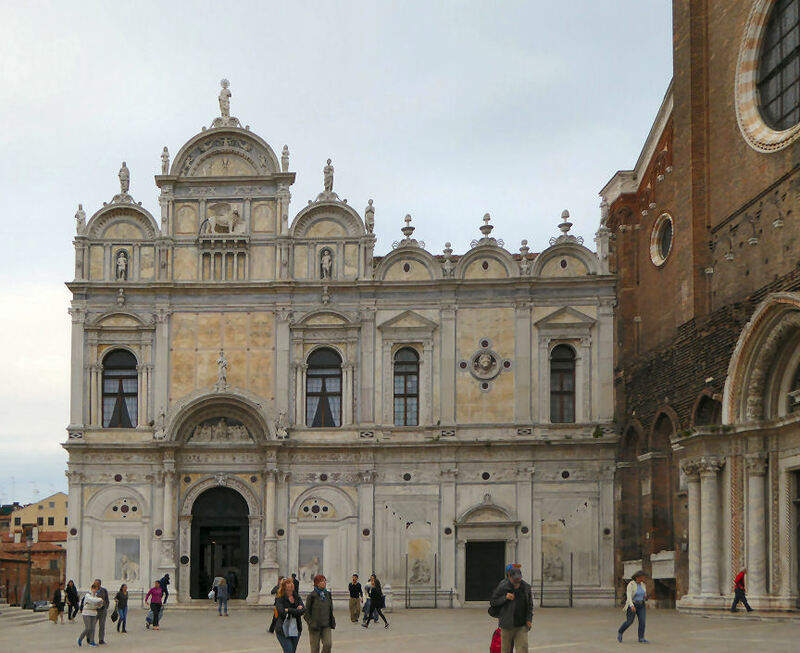 Membership of the Scuole Grandi was limited, the Scuola di San Marco was allowed 600 members and the others 550. The government of the scuole involved four major officials - the leader (guardian grande), his assistant (vicario), a record keeper (scrivano), and a master of the novices (guardian da matin). Two further deacons (degani) assisted with keeping contact with the brothers, who could be scattered all around Venice's sestieri. The officers met regularly in committee (banca) and by the early 15th century all officers had, by law, to be native-born citizens of Venice. 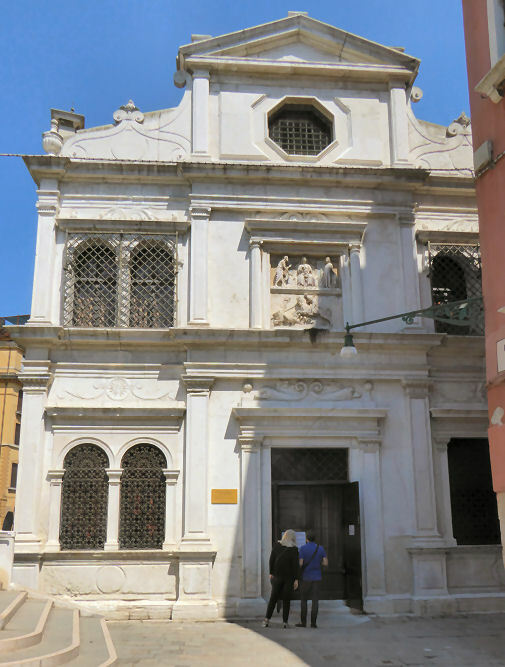 Like many other religious institutions the scuole were suppressed by Napoleon in 1806, with only San Rocco and the Carmini allowed to keep their art intact. But later in the 19th century some were re-established, including the Scuola San Giovanni Evangelista. 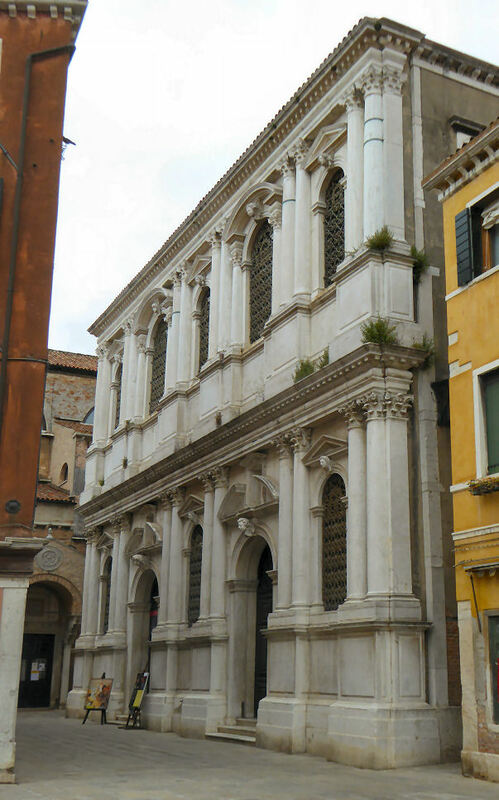 In 1260 the Scuola di Santa Maria della Carità, the first Scuola Grande, was founded in the church of San Leonardo. The scuola then rented rooms from, and near, the monastery of Santa Maria della Carita, and later bought land and buildings from the monastery. 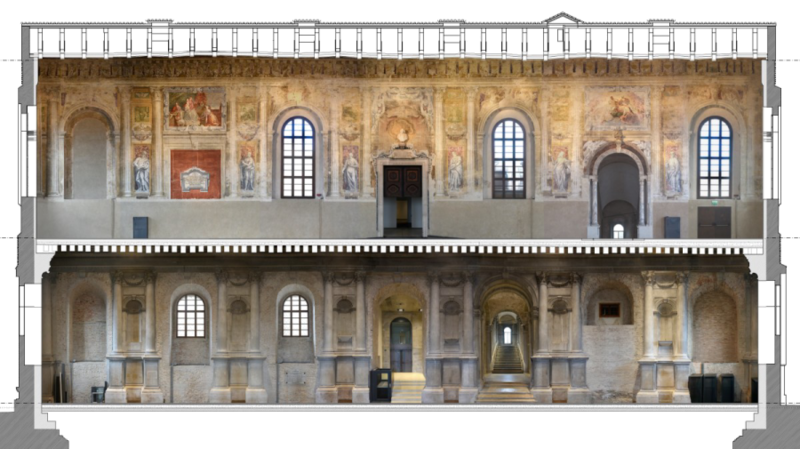 By 1343 it had two meeting rooms one above the other and this may have been the original model for later scuole buildings - comprising of an upper meeting room (sala) and a lower meeting room (androne). In the mid-15th century an extension was added as an albergo for the meeting of the banca. This building's façade can be seen in the background of Canaletto’s Stonemason’s Yard. Titian was later commissioned to paint a Presentation of the Virgin on one whole wall of the Sala dell’Albergo. From this room the banca distributed alms and choose young women to receive dowry contributions. The only additions after 1560 were in the mid-18th century when Giorgio Massari changed the façade and Barbardino Maccaruzzi designed the curved double staircase. In the early 19th century the scuola and the adjacent church and convent buildings were transformed into the Galleria dell’Accademia. Work began in 1811, headed by Giannantonio Selva, and the gallery opened in 1817. The first room at the top of the staircase as you enter the galleries is the former chapter house. It has a gilded ceiling said to be by Marco Cozzi. It is one of the two rooms where the scuola building's original features can be seen. The other is the albergo, which is adjacent to the chapter house, but comes at the end of the tour. It has surviving benches and a 15th Century ceiling, along with Titian's very architectural Presentation of the Virgin in its original position. The gallery contains many works from the suppressed and demolished churches mentioned elsewhere on this website. You enter the gallery through what was the scuola entrance. 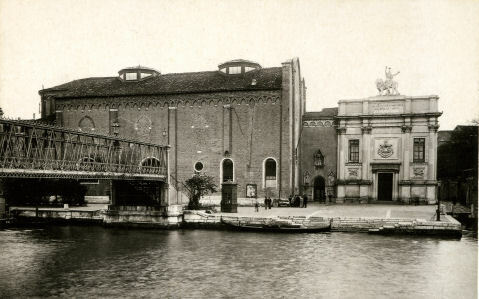 The old postcard (see right) shows the buildings before the coming of the vaporetto stop, and also shows the original iron bridge. The carved panel over the main doorway and the statue on the roof are all long gone. The panel (The Coronation of the Virgin by Bon) is now in the Salute and the statue is now to be found in the Giardini Pubblici. Jan Morris says of the latter "the silliest lion [in Venice] stands in the Public Gardens, removed there from the façade of the Accademia: Minerva is riding this footling beast side-saddle, and on her helmet is perched another anatomical curiosity - an owl with knees." The first room upstairs, the former chapter house of the Scuola, has a gilded ceiling said to be by Marco Cozzi. It is one of the two rooms where original features can be seen. The other is the sala dell'albergo of the Scuola, which is adjacent to the chapter house, but comes at the end of the tour. 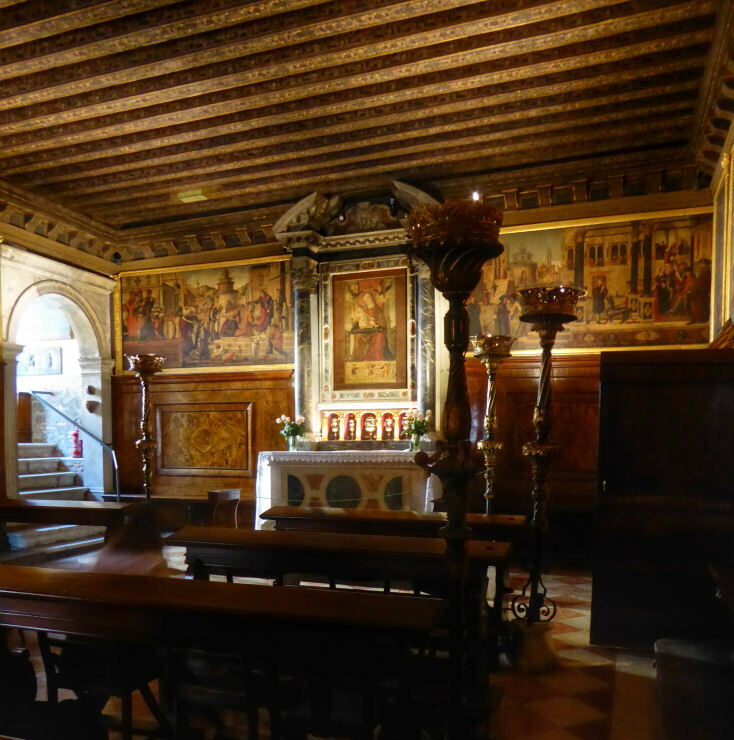 It has benches and a 15th Century ceiling, along with Titian's very architectural Presentation of the Virgin (see right) in its original position. Jacobello del Fiore painted large frescos of apostles for this scuola in 1418. The scuola had a Giovanni Bellini Madonna and Child with a Glory of Red Cherubim, now in the Accademia. As is the Fathers of the Church Polyptych, which Antonio Vivarini and Giovanni d'Alemagna painted in 1446 for the sala dell'albergo here. A competition to paint The Presentation of the Virgin, as part of a sequence devoted to the Life of the Virgin. had been won in 1504 by Pasqualino Veneto, a minor artist, who had died soon after. It took the board of the Scuola another 30 years to finally commission Titian, on 29th August 1534. His main challenges were the size and having to incorporate a door. The composition is traditional, rather than innovative, and this may be down to the commissioners, who may have even insisted on retaining Pasqualino's original composition. The obelisk, a frequent feature of Presentations, is traditionally symbolic of the sun, and by association Christ as the light of the world. The painting is lit from the left, reflecting the presence of a window to the left which had been adjusted during painting by the officers for this purpose. Mary's parents, Joachim and Anna, can be seen in the background leading a procession of of officers of the Scuola. Amongst the portraits identified amongst the staffage at various times are Bembo, Aretino, Titian (he's the old woman, he's in the clouds! ), and his daughter Lavinia. The hag with her eggs and chickens is also much discussed in the literature, Panofsky calling her 'the horrid egg woman'. She may represent unconverted Judaism, she is said to echo similar figures in Cima's Presentation and Carpaccio's Reception of the English Ambassadors in the Saint Ursula cycle and now in a room nearby. 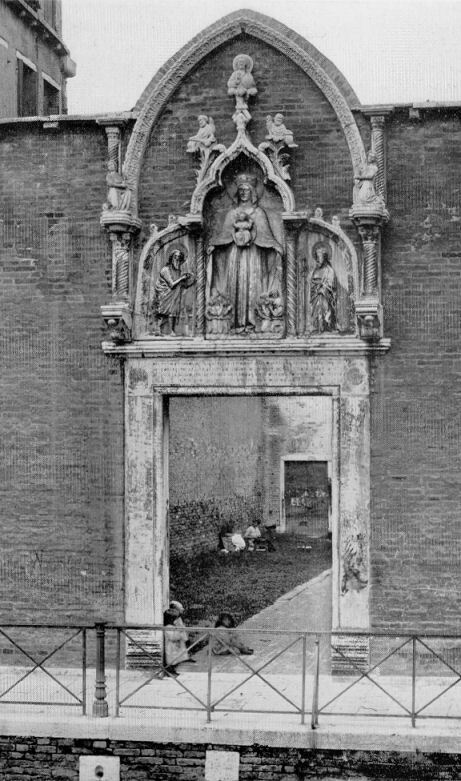 In 1572 the scuola cut another door through the painting, on the left. 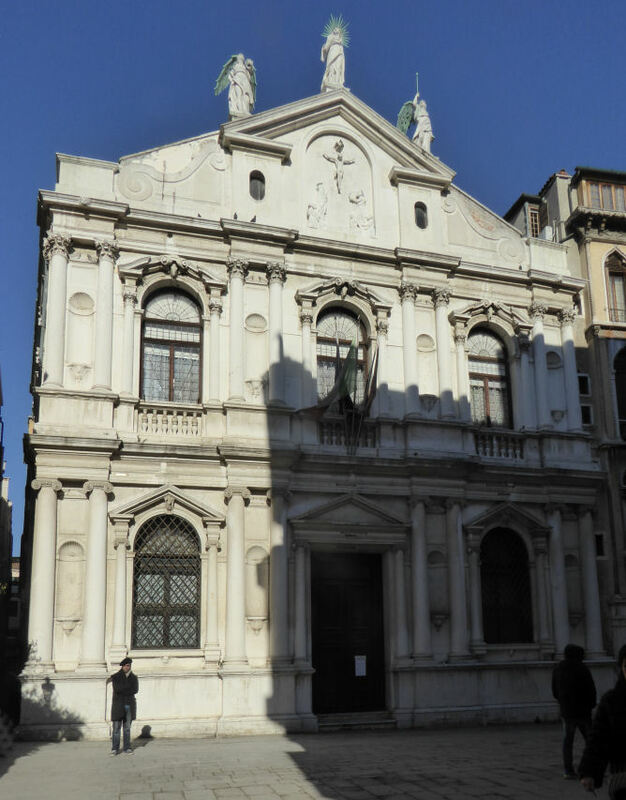 Founded in 1594 under Doge Pasquale Cicogna, this scuola was the last to be recognized as a Scuola Grande in 1597. Initially it had used an altar in the church of Carmini (the third on the right) and a room in the monastery. These rooms changed frequently and were often found wanting. In 1625 the scuola at last took possession of a site to build its own premises, but a couple of years of legal wrangling with remaining tenants and the sellers of the land followed. These continued even after the scuola building was erected. Designed by Francesco Caustello, an architect of whom nothing is now known, it wasn't structurally completed until 1636 and publicly inaugurated in October 1638. 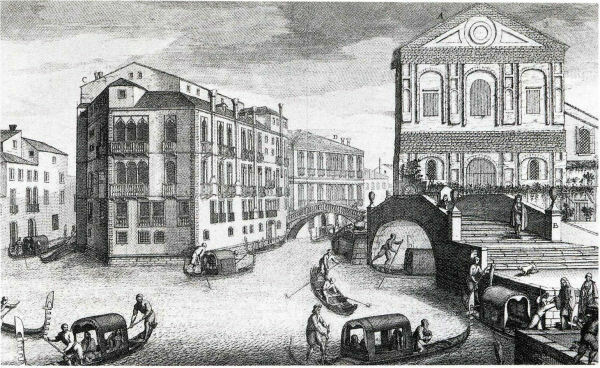 Further purchases of property blocking expansion followed in 1668, and the demolition of a decrepit pharmacy called Alle Tre Frecce (the Three Arrows). For the next two years Baldassare Longhena, architect of the Salute and the Ca' Rezzonico, was employed to expand and embellish in a Baroque style. After the little room where your money is taken you pass the staircase and enter the Chapel which is not a highlight. The monochromes all around, by Nicolò Bambini and his son Giovanni are rare, but lack colour. Up the tunnel-vaulted monumental staircase typical of a Scuola grande - double becoming single, but remaining the same width. It was designed by Longhena and finished after his death by Gaspari. Stucco sirens progress to golden angels and putti, mermaids and eagles by Alvise Bossi 1728/9. On the first floor the fine chapter house (Sala Capitolare) has ceiling panels by Tiepolo (1739–1749) with stucco work by Abbondio Stazio. The central canvas, the last to be installed, in 1749, depicts St Simon Stock receiving the Scapular from the Virgin. A scapular can mean a cloak, but here it is a loop of cloth which the friar wears hanging from his neck, bearing a pouch containing a holy image. In the four other pictures, angels carry scapulars and flowers among the clouds. The four corner lunettes represent the virtues. To appreciate the panels you need to stand in the centre and revolve. There are uninteresting dark 18th century panels on the walls by Anonymous, Antinio Zanchi, Gregorio Lazzarini and Amedio Enz. The altar dedicated to the virgin has a statue of the Madonna and Child offering the scapular, by Bernardino da Lugano. To left of the altar is the door to the Hall of the Archives, which has walnut dossals and cupboards. The carved figures are possibly by Giacomo Piazzetta, father of Giambattista Piazzetta who painted the relatively calm Judith and Holofernes (him with his head still on, lying in a drunken stupor) on the left high up as you go into the Hall of the Hostel. It's looking clean as it was restored in 2014. There are two painted panels on the walls by Gaetano Zompini, with two more by Giustino Menescardi who did all nine on the ceiling. Left of staircase is the door to the Sala dell'Albergo, also known as the Hall of the Hostel, where pilgrims once found shelter. The main ceiling panel by Padovanino (Alessandro Varotari) is of The Assumption of the Virgin (1634-8). 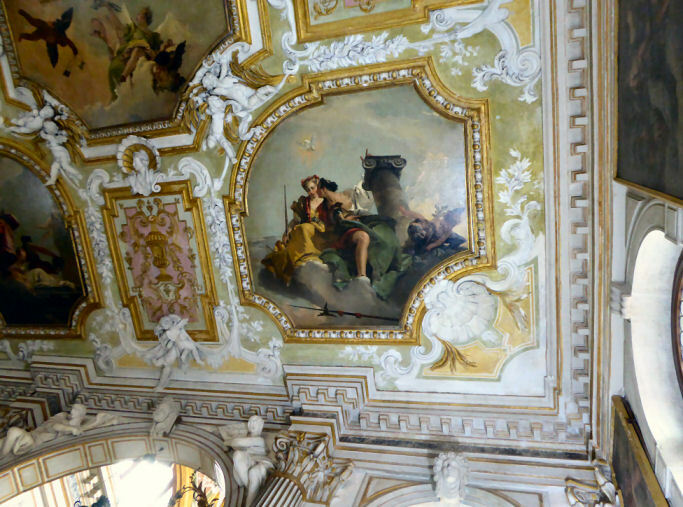 It was moved in here, a century after its completion, when Tiepolo's panels were installed, he having insisted on replacing it, not just surrounding it, with his own work. It is surrounded by oval paintings of the four evangelists and four prophets associated with the Virgin by Giustino Menescardi. The wall paintings include an Adoration of the Shepherds by Ambrogio Bon and two by Antonio Balestra, on the wall towards the Tiepolo Hall - a superior Joseph's Dream (see photo below) and a Rest on the Flight into Egypt both of 1703. Available from the ticket desk, in English and other languages. 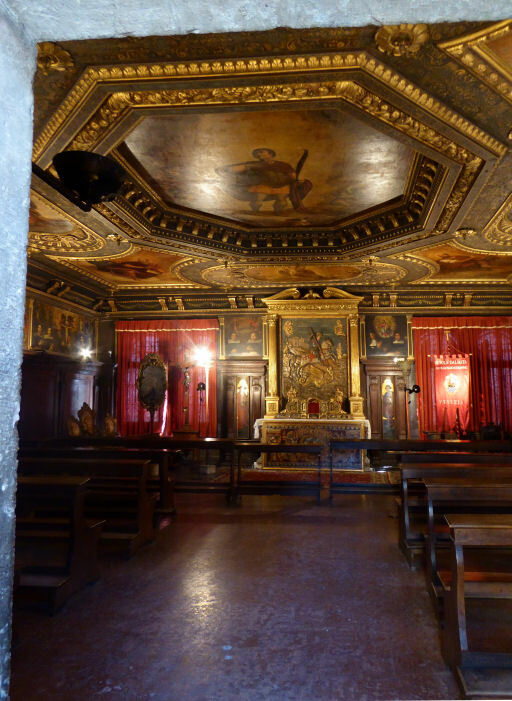 The Scuola Grande di Santa Maria della Misericordia was founded on the 8th of September 1261, with the old scuola hall built on land provided by the Augustinian monastery of Santa Maria Valverde from 1310, with rebuilding in the 1440s by the Bon family. This involved expanding forward in the campo and erecting a new façade. It had a Gothic arch with a large miracle- working relief of the Madonna della Misericordia attributed to Bartolomeo Bon installed in 1451. 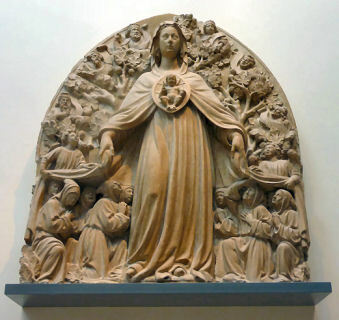 The arch was demolished in 1612, and the relief (see right) is now in the Victoria and Albert Museum in London, along with other sculptures from the scuola. The need for expansion (by the 16th century the scuola had 612 members) led to the building of a new scuola to designs by Alessandro Leopardi from 1507. 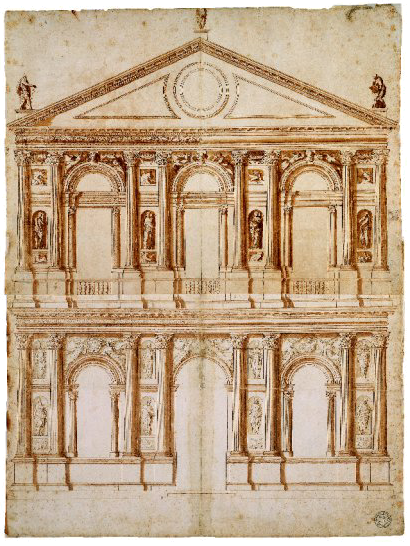 Lack of progress beyond knee height led to Jacopo Sansovino being commissioned to provide a new plan in 1532, but only the ground floor had been erected by the time of his death in 1570. The confraternity finally moved into the new building in 1589. The old scuola building, first rented to a fodder merchant, became a hospice It was later used as a theatre. Now it's used as an art restoration centre, for both sculpture and paintings. This video shows the large Titian from the Sala dell'Albergo at the Accademia being brought here for restoration in late 2010. The new scuola, the huge and unfinished Gothic barn-like building by Sansovino, became, in 1634, the guildhall of the silk-cloth weavers' guild who renovated it in 1730. From 1914 it was used as a gym before recently being restored recently, at a cost of 10 million euros - funding provided by a private company, with much controversy over their feet-dragging and lack of progress for the four years from 2009. It is to be used for biennale exhibits and the like (see photo right) having reopened fully in March 2016. On the ground floor the space is divided into three by large Corinthian columns on tall pedestals (see photo below). Upstairs are frescoes of the Twelve major Prophets between the windows by Alvise da Friso, Paolo Veronese , Padovanino and Domenico Tintoretto made paintings for the scuola tool, some of which are lost. 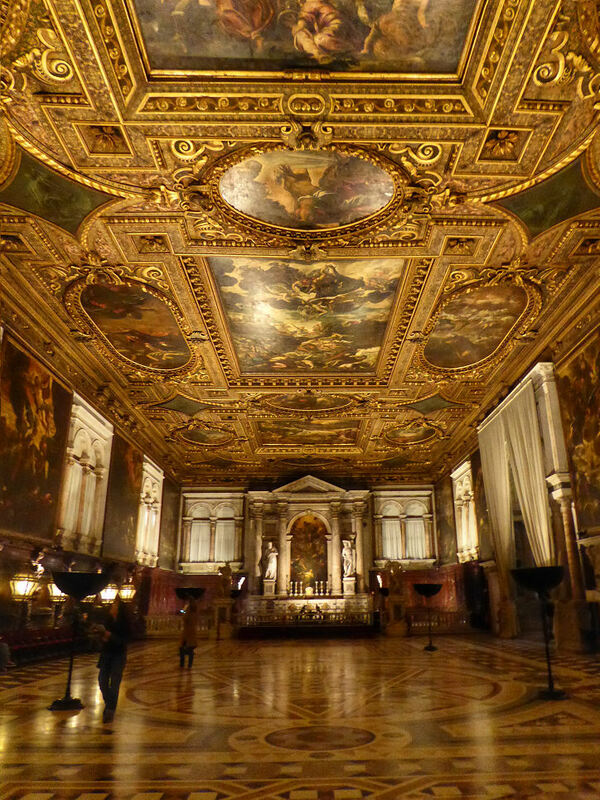 Local resident Tintoretto used the upper rooms here to paint his huge Paradiso for the Palazzo Ducale. The original Order of Flagellants was founded in 1261, making it the third oldest after the Carità and San Marco, founded the year before. 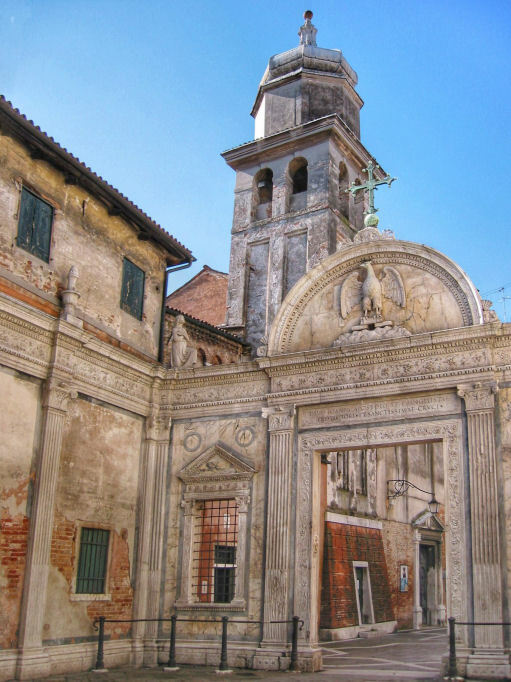 It initially met at the church of Sant’Aponal until it moved in 1301 to the monastery here, and later, in 1340 it rented dilapidated rooms on the first floor of the ospizio (asylum) building opposite from the Badoer family. From the building work of 1349/50 that followed a carved relief remains, as well as possibly the capitals in the Hall of Columns. The number of brothers, and resources, grew, and in 1369 the Scuola was given a fragment of the True Cross by Philippe de Mezéires, the French grand chancellor of the Order of Jerusalem and Cyprus. So it was decided, following the acquisition of the all of the old hospice building in 1389 to build permanent. 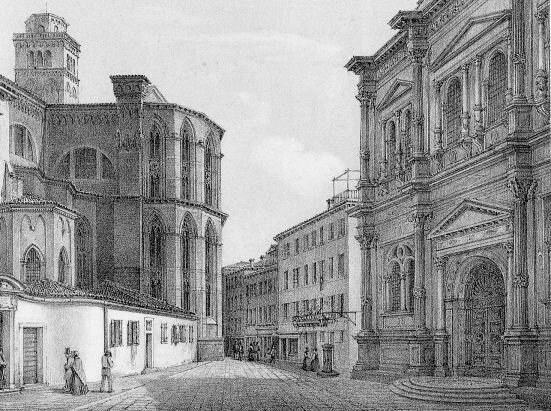 This involved the building of the Hall of Columns and the addition of a second room on the second floor, the Oratorio della Croce, to house the the relic. After 1420 Jacopo Bellini (who become a brother here in 1437) was entrusted to provide a sequence of paintings, to replace earlier works by the likes of Giovanni da Bologna. The end of this cycle of works is commemorated by a plaque below the previous one, dated 8th March 1453 (actually 1454 due to old style calendar). It was at this time that the Scuola commissioned the likes of Perugino, Carpaccio, Gentile Bellini and Mansueti to paint the Miracles of the Cross cycle for the Oratory of the Cross, to celebrate the order's relic, which was kept there. It was suppressed by Napoleon in 1806/7 and in 1814 the Austrians converted it to warehouse for the storage of art looted from the other religious institutions. Surviving plans to build housing here in the mid 19th Century a new confraternity was established in 1929, which was acknowledged by Pope Pius XI on 7th march 1931, and which thrives still. Access to the main rooms is up an impressive staircase by Codussi. You first enter the huge and spectacular Sala Capitolare (see photo right) the rebuilding work of Giorgio Massari in the early 18th Century, including the fine intarsia floor, with large canvases down each side and many panels on the ceiling, all depicting scenes from the life of the scuola's name saint by the likes of Domenico Tintoretto, Marieschi, Balestra, Guarana, Diziani and even Longhi. Over the altar at the end is a statue of Saint John the Evangelist, with an eagle and cherub, by Giovanni Maria Morleiter around 1732/3. The doors either side lead to the Sacristy and the Chancellery, the so-called Stucco Rooms. One contains reproductions of the Miracles of the Cross cycle painted for the Oratory of the Cross here. Next there the Oratory of the Cross which has housed the Relic of the Cross since the late 14th Century and is where the Miracles of the Cross cycle by Bellini and Carpaccio and others used to live. From 1784 to 1788 the medieval oratory was transformed by Bernardino Maccaruzzi, a student of Massari, with gilt pastel stucco work and paintings by Francesco Maggiotto on the ceiling. The walls have - mostly late 16th Century - unspecial works hung to replace the famous Miracles of the Cross cycle. The small Sala dell'Albergo has four panels by Palma Giovane just as you might be thinking this is the one place in Venice without examples of his work, but they are odd scenes, and there's also a rather nice 14th Century Byzantine panel of the Madonna Platytera. It was found in the sacristy of the church being used, face down, as a floorboard. The even smaller final room, the Archive, is now called the Guarana room, as a ceiling panel and two overdoor panels by this artist are to be found here. A Madonna of Humility by Giovanni da Bologna (early 1380s) removed to make way for the Jacopo Bellini works mentioned below, now in the Accademia. From the commission of 1420 from Jacopo Bellini, four scenes from the New Testament have survived The Annunciation and The Birth of the Virgin, now both in the Turin Galleria Sabauda, and The Nativity and The Adoration of the Kings, now both in the New York Stanley Ross Collection. Of the nine canvases in the Miracles of the Cross cycle painted for the Oratory of the Cross, the Perugino Miracle of the Vendramin Ships was lost in the 16th Century. The rest, as detailed below, are in the Accademia. Vittore Carpaccio The Patriarch of Grado Cures a Demon 1494. Givanni Mansueti The Miracle of the True Cross at the Campo di San Lio 1494 and The Miraculous Cure of the Daughter of Ser Benvegnudo of San Polo. Gentile Bellini The Procession of the True Cross in the Piazza San Marco 1496, The Miracle of the True Cross at the Bridge of San Lorenzo 1500 and The Miraculous Healing of Pietro dei Ludovici (see photo right). 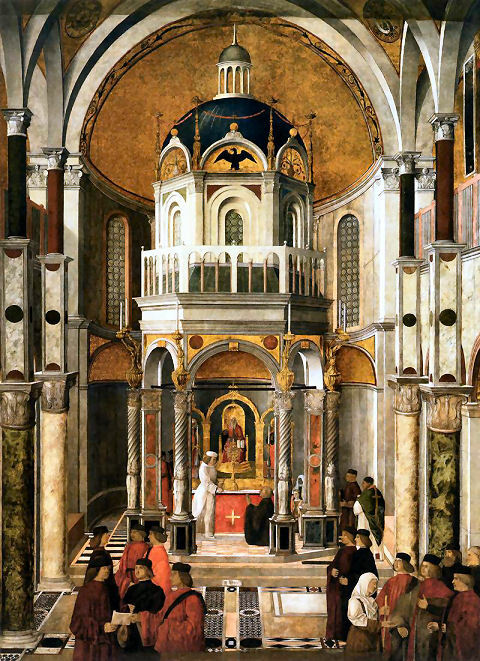 Lazzaro Bastiani The Donation of the Relic of the True Cross c.1495. Benedetto Diana A Child fallen from a Ladder is Miraculously Saved. A central ceiling panel painted by Titian for the new Sala dell'Albergo around 1544, The Vision of St John on Patmos, now in the National Gallery in Washington. It was surrounded by nineteen smaller panels by Titian and his studio depicting The Four Evangelists, nudes and putti, which are all in the Accademia, except for the one which is lost. The scuola and church are open to the public on odd, but previously announced, days from 9.30 - 17.00. Check their website for details and future open days. 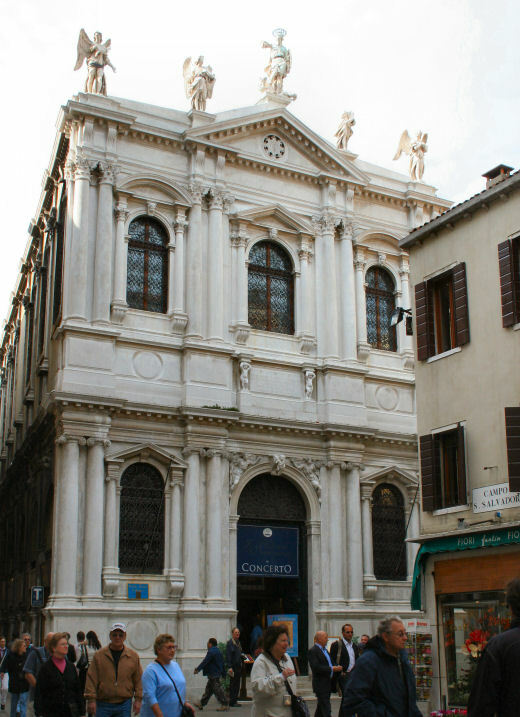 The confraternity was initially based in the sestiere of Santa Croce. In 1438 it moved to its present location beside San Zanipolo, but nothing is known of this 15th century building as it was burnt down in 1485. Paintings by Jacopo Bellini, Gentile Bellini and Bartolomeo Vivarini, commissioned by the officers of San Marco in 1466, also perished in the fire. Given the opportunity the scuola decided to rebuild and expand. By 1490 the new meeting house was largely complete and decoration could begin. Pietro Lombardo and Giovanni di Antonio Buora were responsible for the lower part of the façade and some sculptures from the old façade were reused. 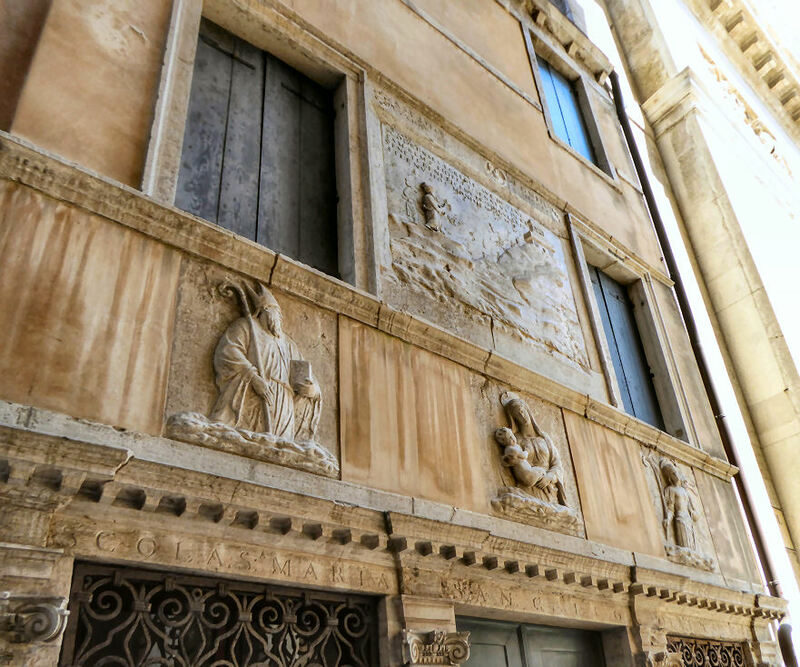 At street level, Pietro’s son, Tullio Lombardo created the four three-dimensional reliefs of the two Lions, together with Saint Mark Healing Anianus and Saint Mark Baptizing Anianus. Marco Codussi completed the upper façade. 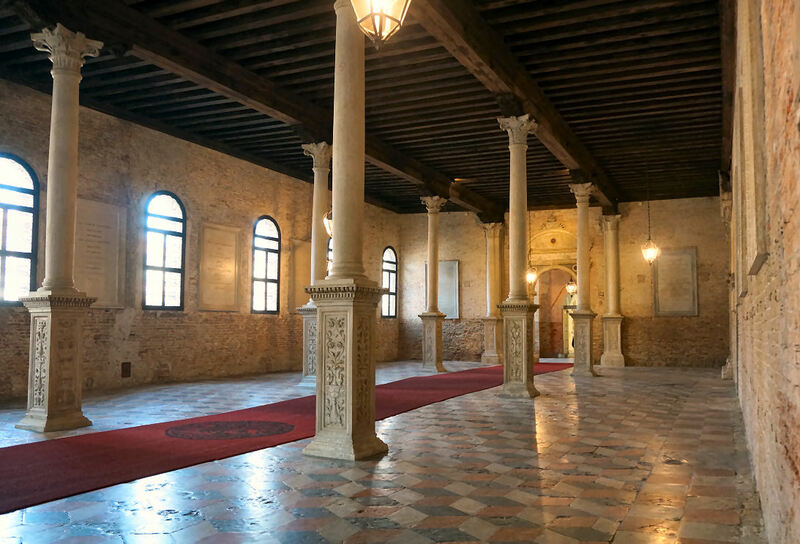 The Scuola di San Marco has just recently been renovated and reopened. Entry is up Mauro Codussi's staircase from the also-cleaned large vestibule (see photo below) which is still the entrance to the hospital. 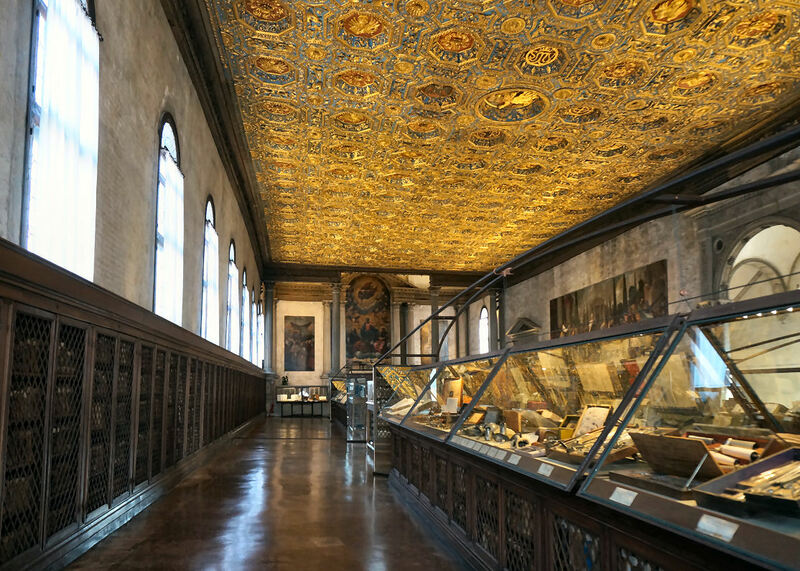 The Chapter Hall (see photo right) has a spectacular gilded ceiling, some big impressive paintings, and large display cases full of medical bits and books, the Scuola still being owned by the Ospedale. It's good that the tags in the cases already look dusty and fly-blown, like at the best neglected museums of medical equipment. So you find yourself staring at a waffle-ironish thing, thinking how rarely waffles have a pointy design on them, and then you roughly translate the Italian and learn that you're looking at a suppository press. Tintoretto's St. Mark Rescuing the Slave (1548) (now in the Accademia) once hung on the wall opposite the the altar between the windows overlooking Campo San Zanipolo. Aretino praised it and Ridolfi says that the scuola were divided on whether to accept the picture, so angering Tintoretto who took it back and kept it in his house for a time. The smaller Sala dell'Allbergo opens off of the Sala Grande. It has had reproductions of the paintings originally sited there inserted above the bookcases. The Preaching of St Mark by Gentile Bellini (completed by his brother Giovanni in 1515 and the most famous work here, with a weird building in the background looking like a cross between the Basilica San Marco and a teapot) (see photo right) and The Martyrdom of St Mark (started by Giovanni and finished by his pupil Vittore Belliniano in 1526) are on the end and entrance walls respectively. 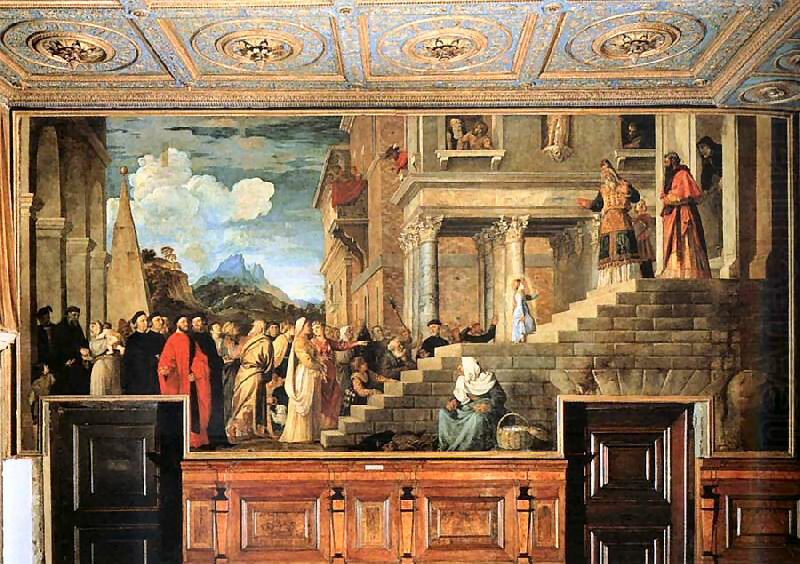 Three more scenes were added by Gentile Bellini's pupil Giovanni Mansueti between 1518 and 1526 which hung on the right side wall, with Paris Bordone's Presentation of the Ring to the Doge of Venice 1534 and Palma Vecchio's St. Mark Saving Venice from the Ship of Demons on the left as you enter. This last painting was copiously praised by Vasari, but he said that it was by Giorgione in the first (1550) edition of his Lives, switching to Palma in the second (1568) edition. All the originals are elsewhere (see below) but the reproductions here are impressive. The series of paintings of the Life of St. Mark for the Sala dell’Albergo mentioned above are all now elsewhere. Gentile and Giovanni Bellini’s Preaching of Saint Mark in Alexandria is in the Brera, where it is overwhelmingly huge and impressive at eye level. The figures in the left foreground are most characteristic of Giovanni, who finished the work after the death of his brother. The Martyrdom of Saint Mark in Alexandria by Giovanni Bellini and Vittore Belliniano is in the Accademia. 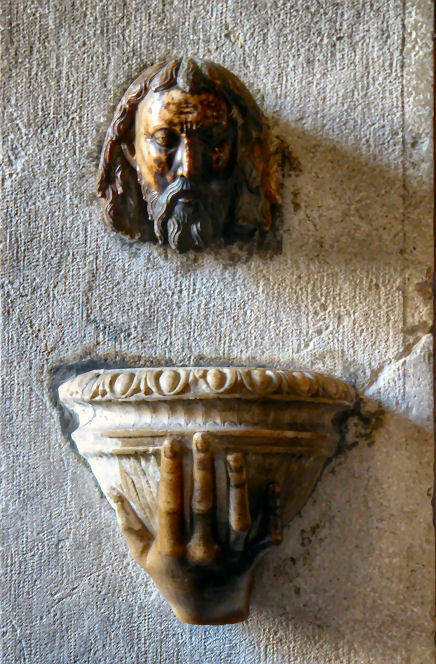 Of the three by Giovanni Mansueti the tall and narrow Saint Mark Baptising Anianus, with its dizzying architecture, is in the Brera, Saint Mark Healing Anianus and Episodes from the Life of Saint Mark are in the Venice Accademia. As are Paris Bordone's Presentation of the Ring to the Doge of Venice of 1534 and Palma Vecchio's Saint Mark Saving Venice from the Ship of Demons, thought to have been completed by Bordone. This last work had been on loan to the Ospedale Civile from 1948 until quite recently. Four by Jacopo Tintoretto: The dramatic St. Mark Saving the Christian Slave of 1548 was the work which made his name. It and The Removal of the Body of Saint Mark and Saint Mark Saving the Saracen are all in the Accademia. The last one, the spooky Finding of the Body of St. Mark commissioned by Tommaso Rangone (who is depicted left of centre) c.1562/6 is in the Brera. 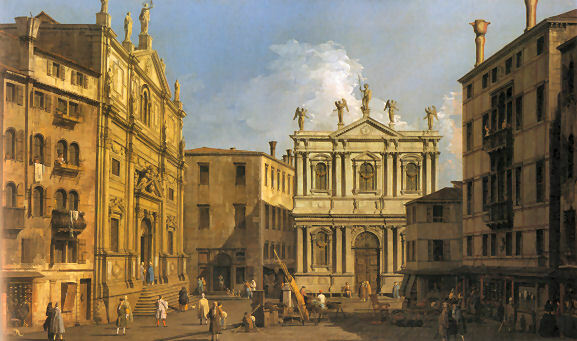 Santi Giovanni e Paolo and the Scuola de San Marco by Canaletto. Founded after the plague of 1478 with initially limited resources. Finances improved, however, with the increased veneration of the dedicatory plague saint, following further outbreaks of plague in 1527 and 1571, and so by the end of the 16th century it was the richest of all the Scuole Grande. 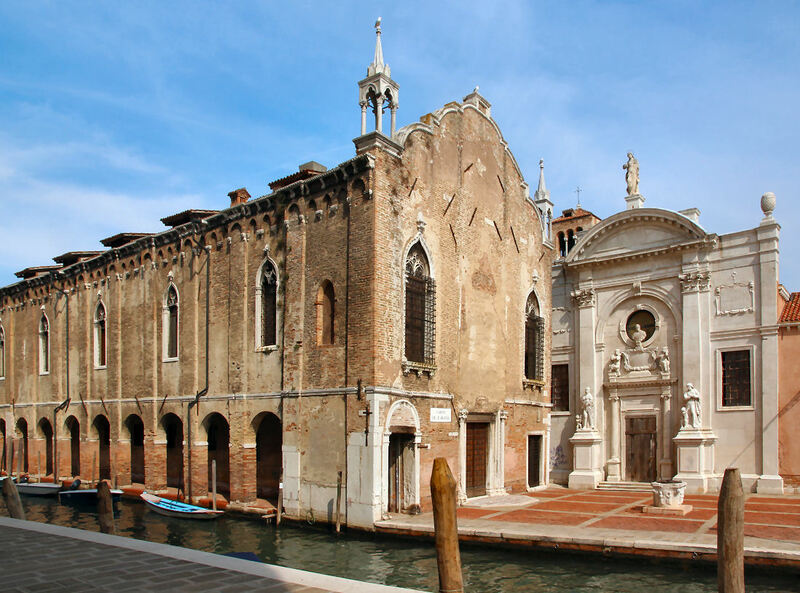 It was the only scuola to build its own church, begun in 1489, consecrated in 1508 and rebuilt in the 18th century. The building of a meeting house was begun in 1517, across the square from the church, first by Pietro Bon, the architect of the church also, who was responsible for the ground floor. He was followed by Sante Lombardo and then, from 1527, by Antonio Scarpagnino, who finished the upper part of the façade and unified the whole with columns. By the mid-16th century the interior was ready to be decorated and in 1563 the board of the Scuola decided to decorate their Sal dell'Albergo. They invited drawings for designs for the ceiling oval from Giuseppe Salviati, Federico Zuccaro, Paolo Veronese and Jacopo Tintoretto. 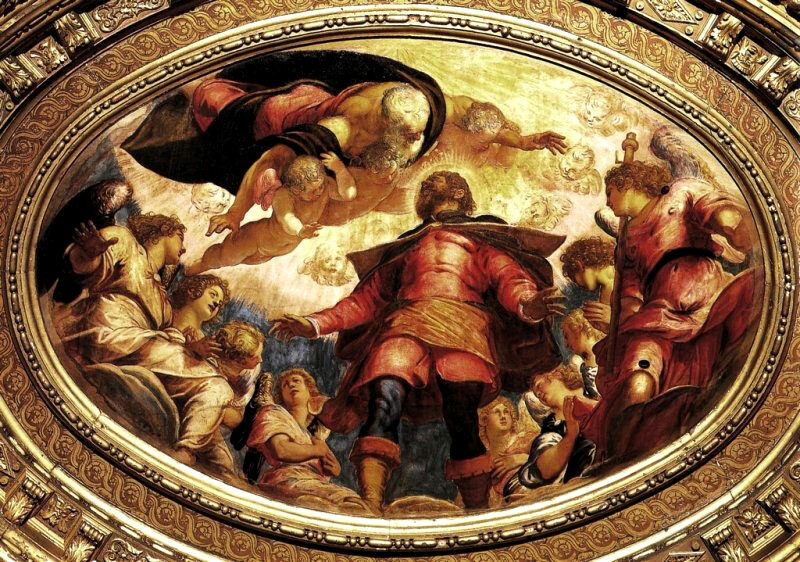 Vasari and Ridolfi both tell us that Tintoretto beat all-comers by obtaining the dimensions of the oval space and installing a painting on the day of judging. (Veronese's drawing for this competition is in the Gardner Museum in Boston.) This work San Rocco in Glory (see below right) won Tintoretto the commission, and is arguably the best work he produced here. Tintoretto worked here from 1564-67. In 1565 he was accepted into the confraternity and they commissioned him to paint the huge Crucifixion in the Sala dell’Albergo. His later work seems to have been on his own initiative and for little or no pay. During 1566-7 he painted three further scenes from the Passion, Christ before Pilate, The Way to Calvary and a Pieta. 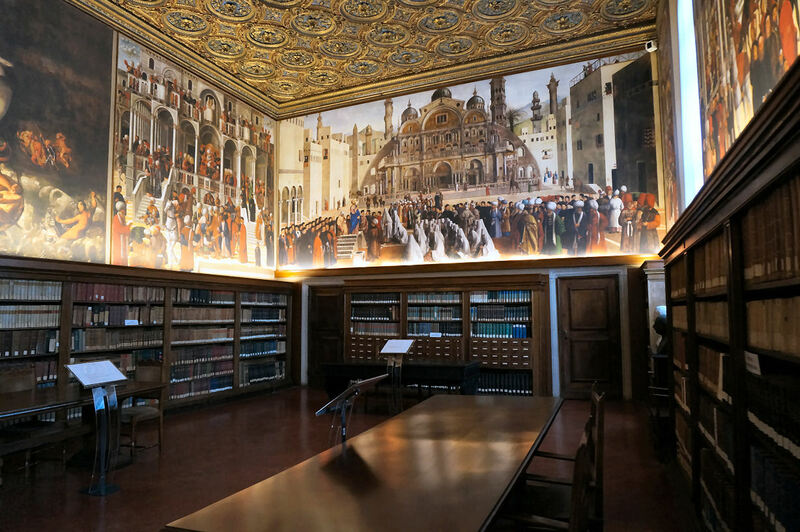 In 1575 he began work on the Salone Maggiore with scenes on the ceiling illustrating the charitable functions of the brotherhood, while the walls were painted with scenes from the New Testament. Between 1583 and 1587 Tintoretto returned to paint the lower meeting room with scenes from the Life of the Virgin. In all he made 64 paintings, almost all in oil on canvas, with only eight diamond-shaped monochrome canvases painted in tempera. These latter deteriorated nad were replaced in 1777 by copies by Giuseppi Angeli. All the paintings are by Tintoretto unless otherwise described. The Sala Terrena on the ground floor with its two rows of five columns has three big panels down the left, of which the first, an Annunciation, is probably the best and most famous. A pair of small panels flank the altar on each side wall. They are of Mary Magdalene and Mary of Egypt and they match but both landscapes are a bit bosky for deserts. There are two more panels on the right-hand side with door tops chopped out of them. The one on the right, an Assumption, shows just how busy and baroque Tintoretto can get. It is, though, thought that this downstairs sala has more input from his assistants, including his son Domenico, partly because he was around 70 by this time, although the Annunciation and the Assumption, being important episodes, are thought to be largely his work. The grand staircase takes you first to a half-floor, where a Titian Annunciation and The Visitation by Tintoretto have now been returned to their 16th century positions. The fresco decorating the small dome at the top of the staircase is by Giovanni Antonio Fumiani, responsible for a ceiling panel in the church of San Rocco and the vast ceiling of San Pantalon. The final long flight of stairs is flanked by enormous works by Pietro Negri and Antonio Zanchi. Then you reach the Sala Grande. Weird big lamps throw bright shadows across the weird carved wooden allegorical figures (by Francesco Pianta in the 17th century) in the panelling at human height, whilst everything above and overhead is by Tintoretto. The 21 ceiling panels are of Old Testament scenes, with the side walls telling 10 New Testament stories. I like the Nativity in the back left corner, with the crib on the stable's mezzanine, and the Baptism next to it is just plain odd. The subjects are a seemingly random selection of stories with the back wall's Saints Sebastian and Rocco the most to the point. But I read later that the seemingly odd, non-chronological, arrangement of scenes is actually a thematic arrangement with scenes cross-referencing. But the adjoining Sala dell' Albergo has the highlights - the huge Crucifixion is one of Tintoretto's very best. 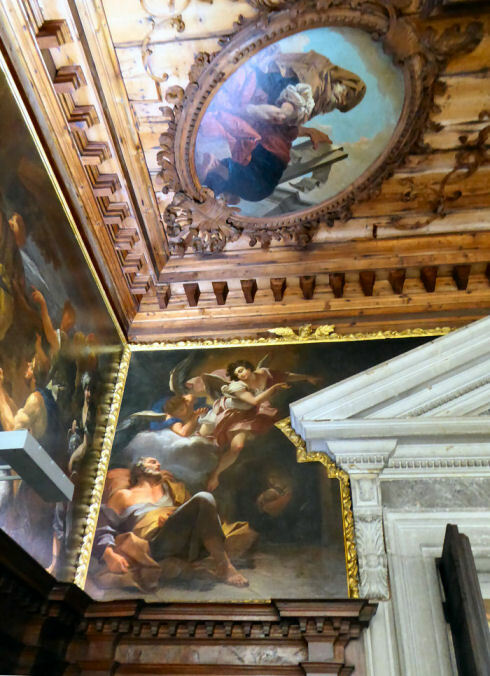 The ceiling panels are very decorative, full of allegories of the Four Seasns, Virtues and the other Scuole Grandi, but the famous San Rocco in Glory in the centre (see right) shines and also has queasy trompe l'oeil appeal. Facing the Crucifixion are the oddly-ordered Passion scenes: The Ascent to Calvary, "Ecce Homo" and Christ before Pilate. The Doge Visiting the Church and Scuola di San Rocco by Canaletto, is famous and in the London National Gallery. The Spy of Venice: A William Shakespeare novel by Benet Brandreth features Tintoretto as an important character and the Scuola (and church) of San Rocco in a couple of key scenes. 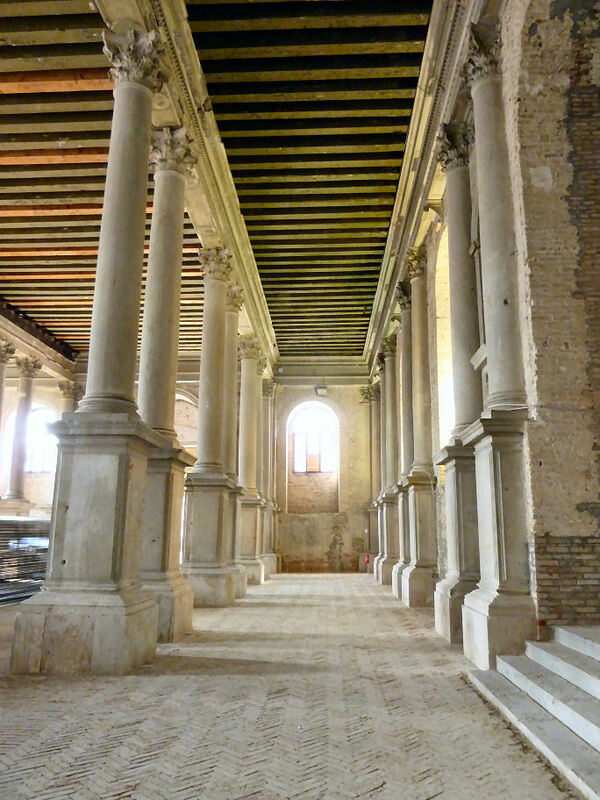 This was originally a scuola piccolo in honour of Saint Theodore, Venice’s patron saint before Saint Mark, and claimed to have been founded in 1258. 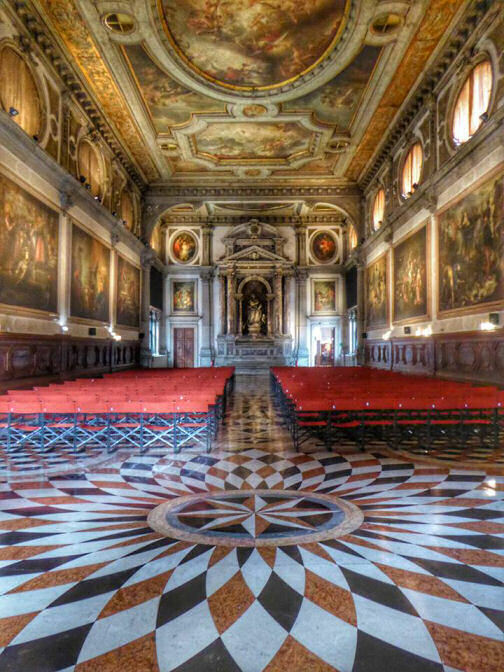 It was the last scuola to be granted scuola grande status, in 1552. Not until 1556 did they decide to build a meeting house but only in 1576 did land became available opposite the church of San Salvador, where they had met hitherto, to build big. Two large meeting halls were constructed one on top of the other. In the 17th century Jacopo Galli bequeathed enough for the scuola to commission Giuseppe Sardi and Baldassare Longhena to build a grand façade and a double staircase. The confraternity was dissolved by Napoleon and the building is now used for concerts and exhibitions. Canaletto, Campo San Salvador, around 1736, Private collection, London. 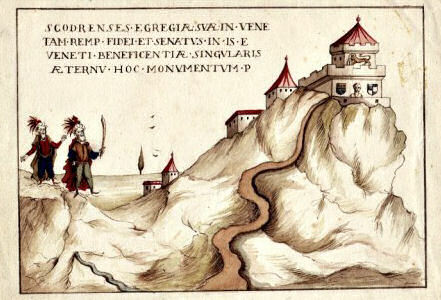 The scuola was established on the 22nd of October 1442 for the Albanian community. Like to the Scuola degli Schiavone it was for immigrants from the Dalmation coast, and also employed Carpaccio. Initially the members met in the monastery church of San Gallo. 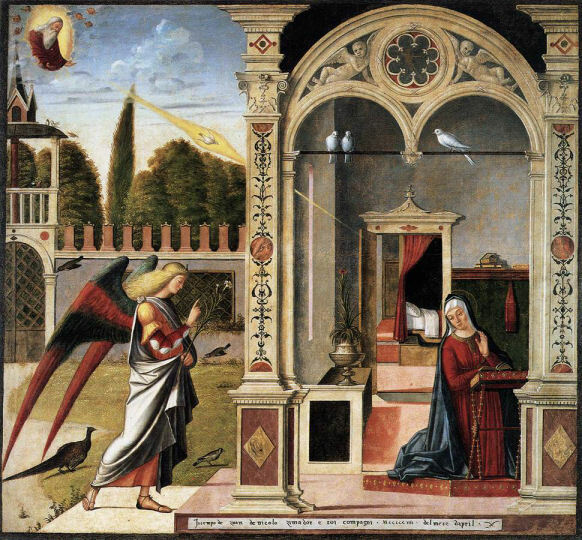 The Virgin and San Gallo were chosen as the patrons of the Scuola. In 1447 the Scuola moved to the church of San Maurizio, this saint then being added as the third patron of the Scuola. In 1489 the scuola acqiared land next to the church and the present scuola building (attached to the left side of the church) was begun in 1497 and finished in 1502, when the lower floor's ceiling was commissioned. Carpaccio's paintings date from the years immediately following. In 1530 the façade was decorated with a shallow relief panel depicting The Sieges of of Scutari. (See right for a watercolour copy) There are also the coats of arms of the Loredan and Da Lezze families, the heroes of these sieges, of 1474 and 1479. Below are deeper relief panels (sometimes attributed to the Lombardo brothers workshop) . These depict the Virgin and Child and Saints Gallo and Maurice. Membership dwindled and in 1780 the Scuola was closed down and the building became home to the Scuola dei Pistori (bakers). In 1808 the scuola, and all the other Venetian confraternities, was closed by Napoleonic laws and its works of art dispersed. The building was converted to residential use. Carpaccio and his workshop painted six scenes from Life of Virgin painted for the Sala dell'Allbergo here. The Birth of the Virgin is in the Accademia Carrara, The Presentation and The Marriage are in the Brera but are not his best. (His Disputation of Saint Stephen from the Scuola di Santo Stefano nearby in the Brera is much better.) The Annunciation (see right) and The Death are in the Ca'd'Oro. The Visitation from in between belongs to the Correr but may be 'in storage' at the Ca'd'Oro. 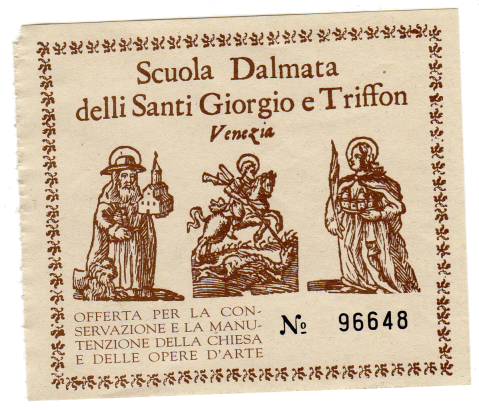 Consecrated to two saints, George and Tryphon who are particularly celebrated in Dalmatia. Venice's ties with Dalmatia were strengthened when the region was conquered by Venice in the early 15th Century. On the 19th of May 1451 the Council of Ten approved the setting up of this confraternity - schiavoni meaning Slavs - which initially met near San Giovanni di Malta. Around 1502 they acquired relics of Saint George and finished work converting a hospital building they'd bought from the convent of Saint Catherine. 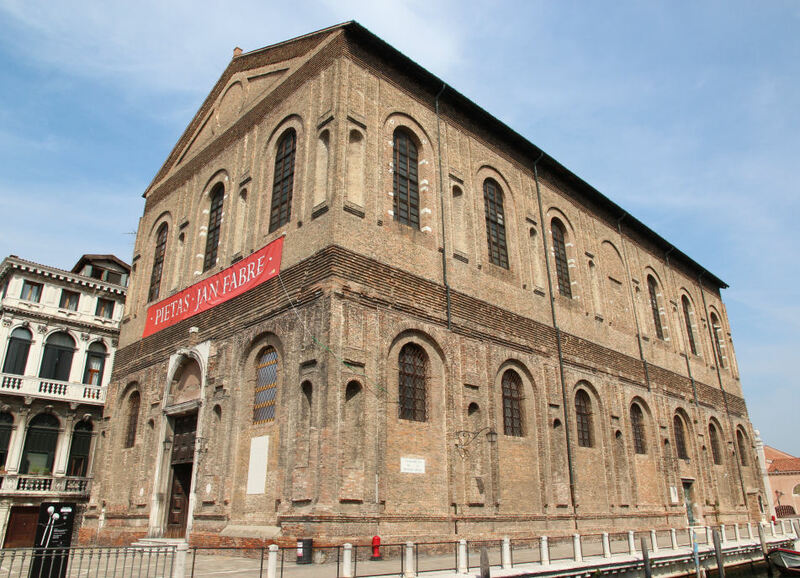 Carpaccio began work in 1502 and in 1551 the scuola was rebuilt in by Giovanni De Zon, overseer at the Arsenale. This work involved bringing Carpaccio's paintings downstairs, the building of altars upstairs and downstairs, and moving the staircase. Upon suppression in 1806 the Grand Master wrote to Beauharnais pleading a special case for "this last bulwark of the Schiavoni" and was granted a rare exemption from confiscation. 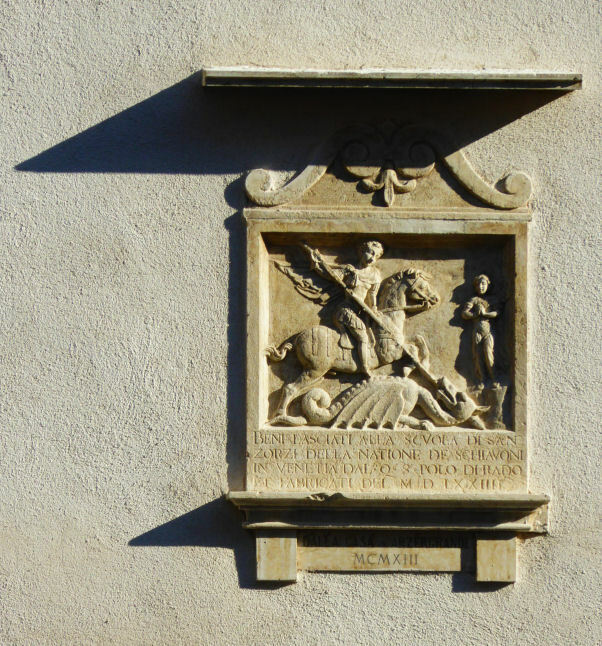 Over the entrance is a relief of Saint George Killing the Dragon (1552), by Pietro di Salò, a pupil of Sansovino, and above it the earlier Madonna and Child with Saint John presenting a brother to Saint Catherine (mid-14th century) by a Venetian sculptor. The outside wall down the right also retains traces of the building before the 1551 rebuilding. Downstairs are the justly famous nine panels painted byVittore Carpaccio between 1502 and 1508 dedicated to the patron saints of the scuola. On the right are three well-known scenes of the life of St. Jerome and two New Testament scenes: The Agony in the Garden (from Matthew's gospel) and The Calling of St. Matthew painted in 1502. On the left is the legend of St. George in three scenes, (his killing the Dragon, his Triumph and his Baptism of the Gentiles). These and St. Tryphon and the Basilisk were painted in 1507. The Madonna and Child over the altar is by Benedetto Carpaccio, son of Vittore. It had previously been attributed to Catena. The door to the right of the altar leads to the sacristy, which had been used by the Scuola di San Giovanni, but following that scuola's suppression it was incorporated into the Scuola Dalmata in 1839. It now contains the scuola's 'important objects' - silverwork and such. Upstairs even the Scuola's own guide speaks of works, mostly from the 17th century, 'of little artistic interest'. 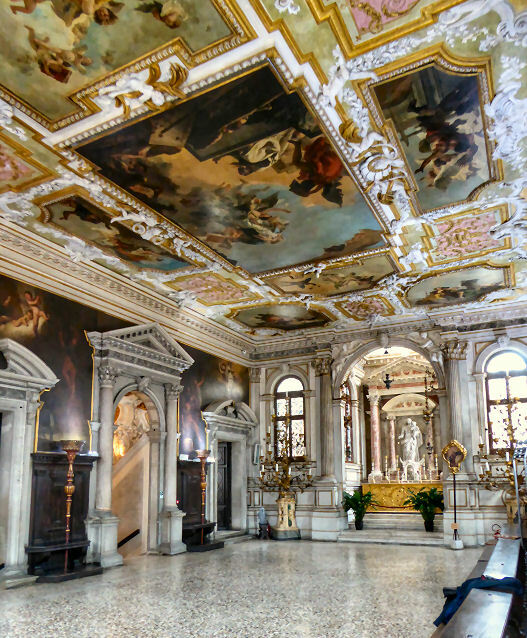 The upper hall (Sala dell'Albergo) (see photo below right) has a wooden ceiling worked by Zuane de Bastian in 1604, with painted panels by Andrea Vicentino. The carved wooden altarpiece is quite interesting. It was probably the ceiling roundel up here when the Carpaccio's where on the walls. It's flanked by a pair of panels, depicting Jerome and Tryphon described as 'influence of Antonio Vivarini'. Of the figures of the princess and her father in the second St. George scene: there is nothing elsewhere in art that is the like of this little piece of work for supreme, serene, unassuming, unfaltering sweetness of painter’s perfect art. And on a Christmas visit after the death of Rose la Touch he came over all mystical and hallucinated that she was communicating with him via symbolic plants and parrots in the Carpaccio paintings. Note These times vary depending on which website you consult, and they sometimes feature a lunchtime closure. The above were on the door in May 2016. 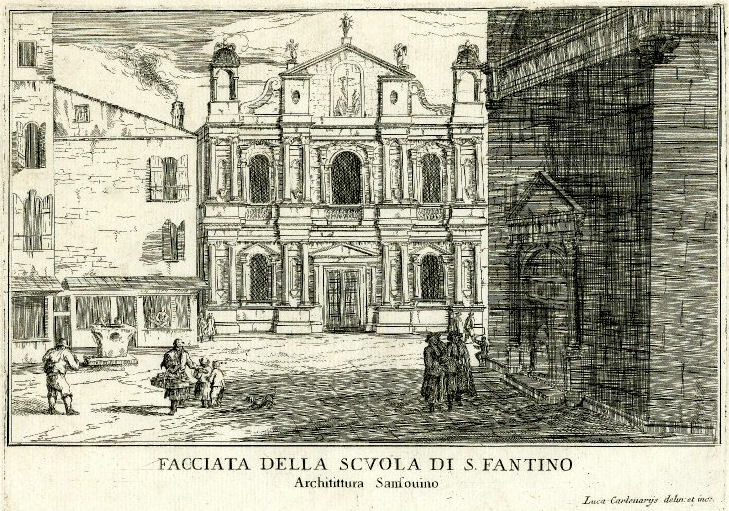 Also known as the Scuola di San Girolamo and the Scuola di Santa Maria e di San Girolamo. Members accompanied and comforted condemned criminals on their way to their place of execution, so they were also known as the Scuola dei 'Picai' (of the hanged men) They originally met in the nearby church of San Fantin. The building dates to the late 16th century. 1687?? Lorenzetti says it was designed by Antonio Contin with help from Alessandro Vittoria. The pediment is topped with statues of the Virgin Mary and two angels by Andrea dell'Aquila and Agostino Rubini, pupils of Vittoria. The relief of the Crucifixion is by Andrea dell'Aquila. In 1806 the Scuola was abolished by Napoleon, the oratory's altars were removed and the building became home to Società Veneta di Medicina. It now houses The Ateneo Veneto di Scienze, Lettere ed Arti, an institution created by merging this medical society with two others. It's dedicated to science, literature, art and culture, with the aim of promoting social solidarity, we are told. The oratory on the ground-floor is now their conference hall. The albergo, on the first floor, is a reading-room. Around 1664 the albergo piccolo was added (now the Sala Tommaseo) and the new sacristy on the ground floor, which is now a meeting-room. The art collection promises works by Tintoretto, Veronese, Palma il Giovane (ceiling paintings in the oratory Sala Terrena? ), Antonio Zanchi, Francesco Fontebasso, Pietro Longhi and Alessandro Vittoria. The Assumption of the Virgin, ceiling of the Albergo by Palma Giovane, damaged by rain water and the ceiling's collapse, removed in the 19th century and cut into pieces.